My column in the new issue of American Scientist is about the challenges of computing with very large numbers. The column ends with an open question, which I want to restate here as an invitation to commentary. Any system of arithmetic in which numbers occupy a fixed amount of space can accommodate only a finite set of numbers. For example, if all numbers have to fit into a 32-bit register, then there are only 232 representable numbers. So here’s the question: If our numbering system can represent only 4,294,967,296 distinct values, which 4,294,967,296 values should we choose to represent? There is an obvious trade-off here between range and precision: To reach farther out on the number line, we have to leave wider gaps between successive representable numbers. But that’s not the only choice to be made. We must also decide whether to sprinkle the numbers uniformly across the available range or to pack them densely in some regions while spreading them thinly elsewhere. I’m not at all sure what principles to adopt in trying to identify the best distribution of numbers. To frame the question more clearly, I’d like to introduce a series of toy number systems. In each of these systems a number is represented by a block of six bits. There are 26=64 possible six-bit patterns, and so there can be no more than 64 distinct numbers. A function f(x) maps each bit pattern x to a number. Sometimes it’s convenient to regard the bit patterns themselves as numbers, ordered in the obvious way, in which case f(x) is a function from numbers to numbers. In the simplest case, f(x) is just the identity function, and so the bit patterns from 000000 through 111111 map into the counting numbers from 0 through 63. A slightly more general scheme allows f(x) to be a linear transformation, f(x)=ax+b, where the parameters a and b are constants. If a=1 and b=0 we again get the nonnegative counting numbers. If a=1 and b=–32, we have a range of integers from –32 to +31. With a=1/64 and b=0, the entire spectrum of numbers is packed into the interval [0,1). Numbers formed in this way are called fixed-point numbers, since there’s an implied radix point at the same position in all the numbers. By adjusting the values of a and b, we can generate fixed-point numbers to cover any range, but they are always distributed uniformly across that range. Floating-point numbers are not distributed uniformly; they are densest at the bottom of their range and grow sparse toward the outskirts of the number line. Specifically, the density of binary floating-point numbers is reduced by half at every integer power of 2. In the toy model, the gap between successive representable numbers is 1/16 in the range between 1/2 and 1, then 1/8 between 1 and 2, then 1/4 between 2 and 4, and so on. At the top of the range—beyond 64—the only numbers that exist are those divisible by 8. The graph below compares the distribution of numbers in the four six-bit systems. For fixed-point numbers the graph is necessarily a straight line, since the numbers are distributed at equal intervals. The floating-point graph is a jointed sequence of straight-line segments, with the slope doubling at every power of 2. The logarithmic numbers produce a smooth curve, concave-upward. (Again, this curve could be made to coincide with that of the floating-point numbers.) The level-index curve is also smooth but has an even more pronounced elbow or hockey-stick form. Now it’s the logarithmic system that yields a straight-line graph. The floating-point curve approximates a parallel straight line. The fixed-point graph is concave-downward, while the level-index curve is sigmoid. By twiddling various knobs and dials, we could create a number system that would approximate any monotonic line or curve in this space, giving us fine-grained control over the distribution of numbers. For example, on the semilogarithmic graph a straight line of any positive slope can be generated by adjusting the base of the logarithmic number system or the radix of a floating-point system; a larger base or radix yields a steeper slope. 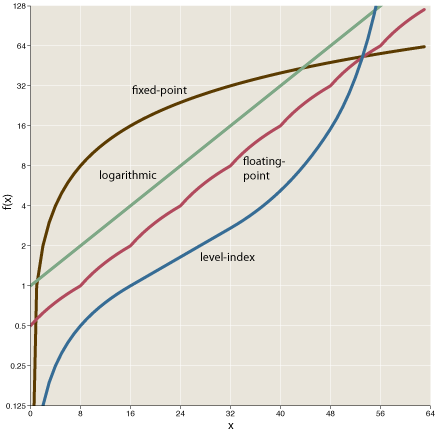 The inflection of the level-index curve can be altered in the same way, by choosing different bases. If we wished, we could interpolate between the fixed-point curve and the logarithmic curve by creating number systems in which f(x) is some polynomial, such as x2. If we wanted a flatter curve than the fixed-point system, we could build numbers around a function such as f(x)=√2. So many ways of counting! Let me count the ways. And what about the level-index system, which skews the distribution even further, providing higher resolution in the neighborhood of 1 in exchange for a sparser population out in the boondocks? An argument in favor of this strategy is that overflow is a more serious failure than loss of precision; the choice is between a less-accurate answer and no answer at all. Level-index numbers grow so fast that they can effectively eliminate overflow: Although it’s a finite system, you can’t fall off the end of the number line. One thing that I believe will last is floating point arithmetic. Of course, the details will change, and in particular, word lengths will continue their progression from 16 to 32 to 64 to 128 bits and beyond…. But I believe the two defining features of floating point arithmetic will persist: relative rather than absolute magnitudes, and rounding of all intermediate quantities. Outside the numerical community, some people feel that floating point arithmetic is an anachronism, a 1950s kludge that is destined to be cast aside as machines become more sophisticated. Computers may have been born as number crunchers, the feeling goes, but now that they are fast enough to do arbitrary symbolic manipulations, we must move to a higher plane. In truth, however, no amount of computer power will change the fact that most numerical problems cannot be solved symbolically. You have to make approximations, and floating-point arithmetic is the best general-purpose approximation idea ever devised. At this point, predicting the continued survival of floating-point formats seems like a safe bet, if only because of the QWERTY factor—the system is deeply entrenched, and any replacement would have to overcome a great deal of inertia. 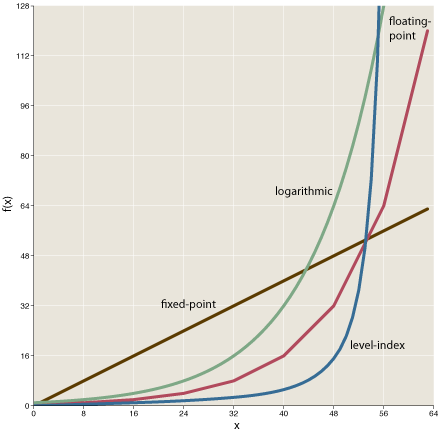 But Trefethen’s “two defining features of floating point arithmetic” are not actually unique to the floating-point system; logarithmic and level-index numbers (and doubtless others as well) also employ “relative magnitudes” and require “rounding of all intermediate quantities.” It may well be that floating point is the best general-purpose approximation idea ever devised, but I’m not convinced that all the alternatives have been given serious evaluation. Two further notes. Because of space constraints, my American Scientist column appeared with a painfully truncated bibliography. I have posted an ampler list of references here. Also, would anyone like to have 10 million digits of pi on microfiche cards? While scrounging in my files for interesting lore on large numbers, I came upon a yellow envelope in which 10,015,000 digits of pi fill up nine fiche cards. The envelope bears the notation “rec’d from Y. Kanada, Univ. of Tokyo, 1983.” The 10 million digits set a record back then, which I noted in a brief Scientific American news item. It seems a shame to destroy such a curious artifact; on the other hand, I can think of no earthly use for it. Kanada’s group has gone on to calculate more than a trillion digits of pi, but he didn’t send me the 900,000 microfiche cards it would take to hold the listing. - One interesting thing about floating point is that integers (within a certain size) can be precisely represented. Not sure if logarithmic or level index permits that. - With logarithmic and floating point, you can specify the roundoff error as a percentage of the numeric magnitude. With level index, the error percentage increases with the magnitude. - In C, float, double and long double values have limits of (approx) 10^30, 10^308, and 10^4900, respectively. For normal engineering calculations, overflows should rarely be a problem. In my experience, overflows are usually caused by software bugs, so I don’t think level index will eliminate overflows. The point about exact integer representation is a good one. In the present architectural generation, where floating-point adds, subtracts, and multiplies are as fast as or faster than integer ones, the difference between 64-bit doubles and 64-bit integers is hardly worth maintaining, and there are already some languages that don’t bother with a separate integer datatype: Perl, Lua, Q (which has bignums but not fixnums), …. If I had to predict what will succeed floating point, I would guess a system based on the Fast Fourier Transform because that seems to be where computer multiplication is heading. There is a lot more to choosing a numeric representation system than how the representable values are distributed. Assuming the numbers are going to be involved in iterated calculation we will want to try and minimise the error in the rounded result. From the implementation point of view minimising the number of transistors needed could be useful. The density of a representation is minimised by using base e, of which the nearest integer value is 3. Unfortunately implementing 3-valued logic in existing transistor technology would push power consumption well up through the stratosphere, so we have to use 2 as an approximation to e.
Some scientific/engineering calculations are predominantly multiple/divide (rather than add/subtract) so a logarithmic representation leads to faster instruction times (there are some dedicated FPGA based systems that use a logarithmic representation for this reason). The trouble with your proposed number systems is that they are static. Any ideas on an adaptive numbering system that becomes denser around regions that frequently crop up during a calculation? I guess I’m just a fossil from the paleolithic, but the idea of doing integer arithmetic with floating-point numbers gives me the willies. It feels like pounding nails with a fancy torque wrench. Floats are for things we measure, not for things we count. At a deeper level, the issue isn’t integers vs. floats but exact vs. inexact numbers. Thirty years ago Scheme formalized this distinction, providing ‘exactness’ as a property orthogonal to other aspects of numeric data type. But most of the world hasn’t yet caught up with that idea. There are proposals that would allow on-the-fly adjustments of the trade-off between range and precision. The basic idea is to change the allocation of bits to exponent and significand. As for altering the shape of the distribution–the balance between large and small numbers–I guess the most obvious way would be to change the base or radix of the system. If anyone has worked out the details of such a scheme, I don’t know about it. The new IEEE floating-point standard calls for decimal as well as binary arithmetic, so I guess we’ll be seeing a rudimentary version of this idea eventually. I think the aesthetic argument is really a practical argument that is now past its sell-by date. I remember when machine integers were 12 bits and floats were 36 bits (on the PDP-8), and the FP hardware (if you had it, and didn’t need to use the software emulator) could do 24-bit ints as well. In those days, machine integers had a huge speed win built in. Now they simply don’t. As for a + 1 > a, that’s not an identity for any kind of fixed-size number representation. It may be annoying that a + 1 = a for sufficiently large a, but at least with floats we don’t have to put up with the possibility of a + 1 << a. Since a computer can theoretically deal with strings as long as one likes, e.g., the trillion digits of pi, why can’t any integer be represented exactly. The trade-off is that it might take a while to add or multiply them. Your work is so great that I’ve used it to kick off techncal papers of my own, and lessons I’ve taught in both university and high school. Integers MAY have started for counting. But they are most seriously investigated in Number Theory. The connection to the physical world matters. For example, are there physical systems whose energy levels give you only the primes? The semiprimes? What is the biggest number which you can write in this cosmos on ANY imaginably device, given an upper limit to the number of baryons and leptons? At a Theomathematical level, you are dealing with the fact that almost all real numbers cannot be described AT ALL. I’m think that one interesting feature of such a system would be closure of the numbers in the system under addition and multiplication, in which case there is less rounding needed. For instance if you choose the set of numbers with only factors 2 and 3, it is closed under multiplication, and for addition of numbers with values in a 1:1,1:2,1:3 ratio, the result will still fall in the same set. However, this complicates the problem of rounding, when it really occurs. For example, a number like 77 could be rounded to 72 or 81, and it is not clear which one should be chosen just from looking at the number. (in factored form to roughly show the difficulty, is 7*11 closer to (2^3)*(3^2) or 3^4?) On the other hand, rounding of numbers in the floating point system can be done (to adequate quality in a short time)by simple truncations, and it is only slightly harder for level-index. Actually a more annoying problem with floating point is roundoff error. It’s one of those things that can creep up on you. So if some system were to replace conventional floating point, I think it should to a better job of handling roundoff. PS, if nobody else wants the microfiche, I’ll take it…. it intrigues me greatly. exp(-lambda) * ( lambda^n) / n! Doing this in the obvious way fails for n>170 or so, since n! overflows IEEE double precision (10^308). In queueing theory for large call centers, we often need n around 1000 or 2000 or even larger. There are ways around the problem, of course. Oddly enough, I was thinking that an example of a bug would be taking the factorial of a large number. But it that really a bug? Factorials exist (in a mathematical sense) for big numbers, it’s just that the computer can’t always handle them. However if someone showed me their code, and told me, “here I take the factorial of 1000,” I would instantly recognize that as an overflow bug. In my experience, most floating point bugs are due to the “small end” of things, like division by zero, taking the square root of a negative number, of cumulative roundoff error. However, every engineering company does different things, maybe I just never encountered a project where overflow bugs were likely. I was curious how long it would take to print out 10 million digits. Printing the first 1,587, 301 integers took my computer 44 seconds. I enjoyed the printed article, thank you! As far as what numerical format wins, the included quote suggests a new constraint to be considered. I believe that whatever new format is considered, it must contain support for the (exact)positive integers. Symbolic processing gets more common all the time and can be concise as well as exact, but many intermediate stages often involve arithmetic and other series, which can have very large, rational coefficients. Manipulation of these series assume that integers stay that way. Two tenths expressed as a decimal has no exact binary representation, unless BCD is employed. But a decimal number is already tainted with a hint of inexactness. An integer stands resolute! Why not take advantage of this as an error check while manipulating those coefficients in a “symbolic” expression? I’ll take the Pi microfiche if the museums and a previous poster pass.